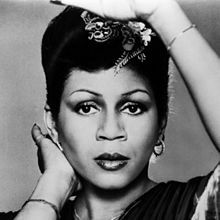 Minnie Julia Riperton Rudolph (November 8, 1947 - July 12, 1979), known professionally as Minnie Riperton, was an American singer-songwriter best known for her 1975 single "Lovin' You". She was well known for her R&B singing. She was married to songwriter and music producer Richard Rudolph from 1972 until her death in 1979. They had two children: music engineer Marc Rudolph and actress/comedienne Maya Rudolph. She was born in Chicago, Illinois. She died of breast cancer at the age of 31 on July 12, 1979. Riperton was born in Chicago to Thelma and Daniel Riperton, a Pullman porter. She was the youngest of eight children. She was raised in a musical family. She embraced the arts early. Although she began with ballet and modern dance, her parents recognized her vocal and musical abilities and encouraged her to pursue music and voice. ↑ 1.0 1.1 "Minnie Riperton". Grave. Findagrave.com. Retrieved June 23, 2013. ↑ Johnson, Robert E. (1979-09-06). "Minnie's Family Faces the Future With her Dreams". Jet (Johnson Publishing Company) 56 (255): 53–54. ISSN 0021-5996. This page was last changed on 14 July 2014, at 05:31.